Today we were faced with a dilemma. 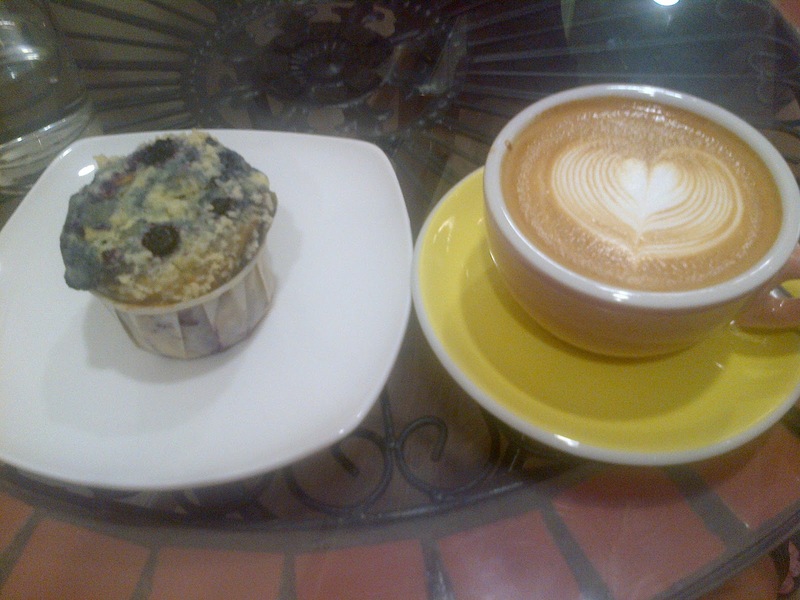 We went to a cafe which serves good muffins of interesting variety and other baked goodies like dark chocolate tarts. The coffee was pretty good too. So what was the problem? Well, the decor was rustic country meets modern. It was confused and did not go together. The space was long and narrow. The tables were wrought-iron garden furniture style, the hanging lights were contemporary. The wood laminate were light-coloured and looked quite tacky. The shelving were used in an untidy manner and there were stools stored under them. A showcase for cakes and pies was stacked on the shelf backwards so that the employees could open the doors however that meant the customers had to look at the knobs and untidy wires. The airconditioning also dripped. We struggled with the form over substance issue. Many other cafes looked good but the food was mediocre. This one was the complete opposite. It was not a difficult fix, they need to tidy up and decide what look they want. I say ditch the garden furniture and fix the drippy airconditioning. And tidy up! I firmly believe it is a sign of old age when one starts appreciating exotic skin and prints like snake, crocodile, leopard and tiger. When one was young, one avoids these like the plague, but suddenly you get to a certain age, something comes over you and you just develop a love or even an obsession for them literally overnight, with no warning symptoms whatsoever. Mine hit me about 3 years ago when an obsession just overcame me and I spent nights surfing online shops for exotic skin bags and shoes. This really roomy clutch (snake I think) was procured from Rozelle Markets in Sydney. I had lost out on another clutch to my friend, C who had seen it first and with the laws of shopping, whoever has their claws on the item, gets first dibs on them until they relinquish it. C did not relinquish and so you snooze, you lose. 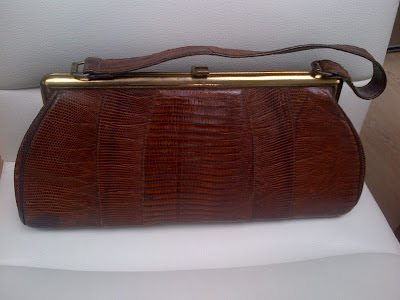 Hence when I spied this clutch on a subsequent trip to Rozelle with C, I grabbed this immediately. And I use it all the time now. 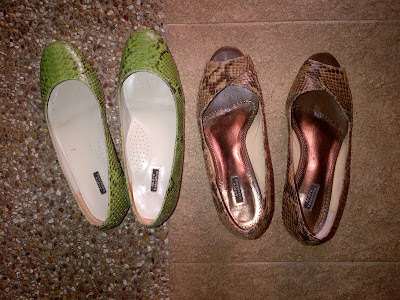 And then when I was in a departmental store, I heard these 2 pairs of snake skin shoes call out to me. It didn't matter that they were BOTH a size too small for me. 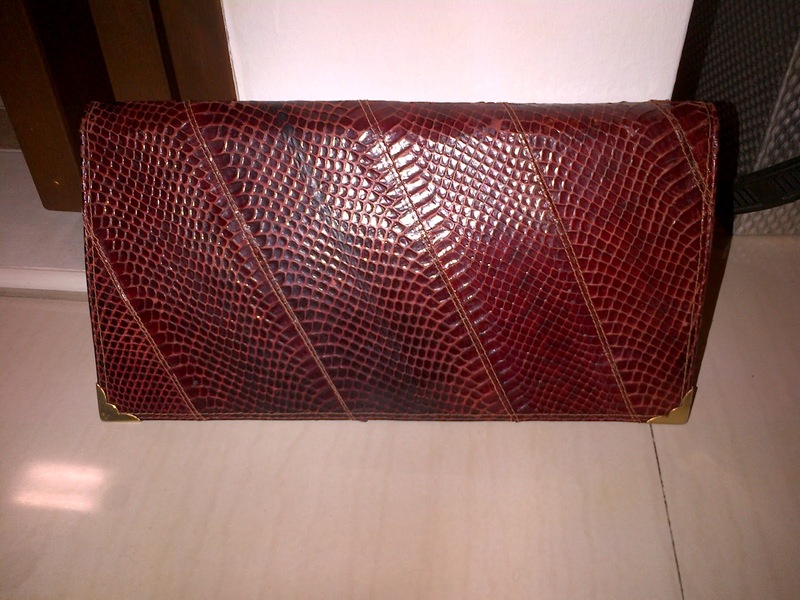 I let myself be convinced by the salesgirl that "leather will stretch". I kinda forgot that even if leather stretches, it stretches sideways to become broader. It is virtually impossible to stretch LONGER. Why I didn't realise that then and also for the next few months as I squeeze my feet into these shoes, hoping for the day they will suddenly stretch to fit, will come quickly. My sister, a government scholar pointed that fact out to me recently, it didn't occur to me for some reason, perhaps I was in denial. I don't think the fact that one of us was awarded a scholarship alluded to intellect. But with this realisation, I think I have to let them go. I drooled over this little 1950s lizard skin handbag for months before I actually purchased it online. It wasn't cheap and I was telling myself that I was buying it for my online vintage business while secretly wanting it for myself. So I needed to turn a profit on that and like I said, it wasn't cheap. But I finally bought it and it was as lovely as it looked online. So do you agree that it is a sign of old age when one suddenly develops this exotic skin fetish - almost like a from hate to love type of story?